Thanks so much for playing along with our latest masculine birthday clean and simple challenge! It's so fun to see everyone's interpretations! We really do thank you all for playing along with us each week. Before we get to our Headliner, let's see what caught the fancy of our design team! 1. 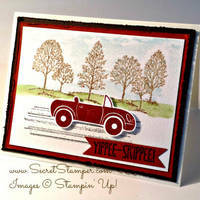 Ann’s Choice: A Cajun Craze convertible and the sentiment “Yippee Skippee” combine to make Debbie’s card uber-cute. Congrats! 2. 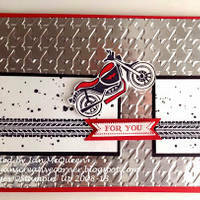 Nance's choice: Love the Evil Knievel look of Jan's fun card! Great use of the sketch and road stamp. Congrats, Jan! 3. 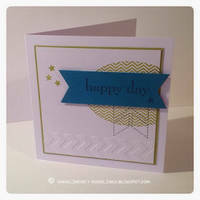 Sandy’s Choice: Lindsey achieved lots of visual interest while still keeping her card CAS. Congrats! 4. 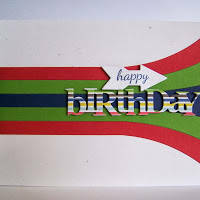 Jaydee's Choice: I couldn't resist Jean's bright, bold birthday card. it's fabulous! This card just made me smile!! Even though it is clean and simple, it is so striking with its bold black & white moustache background paper and the fun image and sentiment! I think it must be from watching all those PBS British shows that this 'stache really appeals to me! Congratulations, Gillian, on being my Headliner this week! Be sure to come back tomorrow for an awesome sketch by the talented Anne Marie! See you then! Congratulations to Gillian for her win, and to Debbie, Jan & Lindsey for being a "a cut above." Thank you, Jaydee for choosing mine to be featured with such fabulous cards!